Let’s forward one year from now – May 2018. Your schedule is packed – but you can still choose what you want to do, anytime. You have complete control of your work life – you decide the hours, the projects, the clients you want to work with, where you want your work to take you, your workplaces and so on. You are the pilot here, riding your own flight. That basically sums up my work life right now in May 2017, and the freelancing business I built over the last one year. But it wasn’t as easy or as impossible as I did think before.There is no magic bullet here – just a simple system with consistent efforts, work and commitment. Pardeep asked me to share my experience as a freelancer. So, I will lay down the entire system and processes that I have followed from the start of my freelancing career, with real-life snapshots, conversations, proposals and much more, that you can literally start using from today! Over the last 1 year, QUITE a lot has happened in my work and business, and I feel I have achieved a few things that I really wanted to do for a long time. This is absolutely not to brag, but more importantly, to show you that anyone can do it. You can do it even under complex life situations, and without any excuses. Hustling a side project: I started building my freelancing business along with my job in February 2016. Oh, and not just another boring 9 to 5 job – I worked at Mu Sigma Inc. The amount of working hours are crazy, to say the least. Quit my job, with sustainable projects: The freelancing business grew so much, that I could not handle it with my job. I finally quit my job in August 2016, and became a full time freelancer, running a location independent business, from my home, coworking spaces, friends’ offices, coffee shops, exotic locations; basically any place, with decent Internet and power. Clients started coming to me,: Designed my freelancing profile and positioned it in such a manner that clients approach and invite me for jobs and I am screening them and their work requirements if they are a good fit for me or not rather than the traditional vice versa process. Build team: Slowly started building a quality driven and closely monitored team to bifurcate my share of responsibilities. My own online business venture: Started working on multiple other side projects in online products that can be scaled rapidly by understanding market needs, competitions, problems, pain points of my target market and niches. One more thing you need to know – I am not a writer, I hardly write! However, this right here is a powerhouse of an article where I break my journey into concrete steps of venturing into a freelancing business. So basically what I’m trying to say is that writing is not my core skill, but I was offered an opportunity to help people start their freelancing business. I have focussed more on adding value, creating a basic structure and system that can be followed by anyone with basic skillsets rather than on my writing skills. I get all of my freelance work from Upwork. The main reason why I chose Upwork was it has premium quality clients, provides top-notch service and ease in payments. They have a payment protection policy and to put it very simply in their words – “One hour worked is one hour paid” on Upwork – no matter what. No invoices, no reminders, no hassles for the freelancer at all in terms of payments etc. Upwork takes 10-20% of your income depending on your stage that you are operating at – but I would gladly trade that much money with the hassles of payment reminders, invoices, bookkeeping and most importantly a centralized platform to operate out at the start. You can choose any of the platform. At the end, your skills matter more than the platform. Toptal is primarily for developers and their screening process is quite strict. The initial step always has to be about identifying the right skills that you will offer to your clients. You should create a small list of what skills you have and what work you have done that can be offered initially to your potential clients. You should also list some skills that you want to learn in the future. To help you find your skills, here are some very simple questions that should get you started. What were you really good at during school & college? What did most of your friends generally seek help from you in terms of skillsets, work etc? How did you really add value and help the business grow in your workplace? Which businesses really need your skills? Which person of the business would most need this help? At Mu sigma Inc, I worked on various different types of analysis for large websites (website analytics) and also built executive dashboards. My core experience and strength was website analytics – so these were what I set out to offer to potential clients. I targeted small-medium businesses that need help in “Google Analytics” and thus went about finding my first customer. You can find 1-2 relevant skills to start off with. You must sell relevant skills together. You should not be a developer, designer and marketing expert at the same time. You can always diversify later – but start off only with one or two skills only. What is one skill that everyone who has been to just school and college has? Reading and writing! You can literally start with these basic skills and apply in multiple different manners and fields like Email writing, Copywriting, and editing. You should not spend a lot of time on your profile but focus on a few important things to add value to your target customer. You must completely separate yourself out of the masses. 98% of freelancing profiles and their websites are all about themselves, their services, degrees and educational qualifications. All these are quite important for the initial context and quick view but the client really cares about solving his problem. In your profile – talk as less as possible about yourself and more about your target customer, their problems, their pain points and how you would go about solving them. At the start, it’s fine if you do not know what is your target market. You should constantly test and refine, as you evolve. Focus on following points while writing your profile. In portfolio – you can add a few samples of any old work that you have done. Do not worry about adding a lot of stuff – just use some quick methods – like screenshots and links of small help you have provided. Your portfolio should be very relevant to the work you are aiming for. Once clients can see the relevant samples in your portfolio – they would love to talk to you. Danny Marguiles – This profile is literally designed to convert. Filled with Testimonials, Call to Actions and much more for his exact target market. He is a pro copywriter and also teaches freelancing. Full disclosure – I have learnt a lot from his blogs and his high end course and wrote about it at length here. Another great profile by Steven Young here. This is a random profile I pulled up. Look at the number of times the freelancer is talking about himself and using the word “I” – that sums up a bad profile. You can search for freelancers on upwork even with your profile and analyze all existing profile. Look at the ones in your field and find the biggest mistakes and just make your profile unique in that manner. Before talking to clients and working towards getting your first paid project, I would highly recommend doing some relevant work before. If you have already done the relevant work before, go ahead and add them in your “Portfolio section” of your profile. If you are not experienced in the work that you want to do, go ahead and do your own project work, anything that can be showcased in the form of a quick portfolio. Yes – this means doing free work and creating a momentum for yourself at the very start. This is where most freelancers fail – so it’s really important you get past this step by doing work irrespective of whether you get clients or not. To be clear, I am not at all advocating doing free work for clients if you are experienced. The only point is for the people who are not experienced, to not sit idle and do work for yourself and for your field so that you are ready as soon as you get your first project. Upwork provides 60 connects every month, which allows you to send 30 proposals i.e. apply to 30 jobs. These should be used strategically as this is an investment given to you. The quality of your proposals is directly proportional to the time taken to get clients to reply to you and eventually landing your first gig. The main role and objective of a proposal is always to just get a response and conversation flowing between you and the client. A proposal will NOT land you a job – if it does, you should be quite wary and careful of the client. It’s very similar to two folks going on a first date and getting married – some serious fast forwarding. Writing proposals (like your profile) will again be all about the job, the customer and how exactly you will help them along with offering extra value. I feel that the bounce rate metric for a website is the tip of the iceberg. We need to look at multiple other metrics and factors to get a holistic understanding and also define the exact problem before jumping to bounce rate. We can define the problem, use all these metrics and do end-to-end analytics to deep-dive and understand the problem and eventually build a website where people really get what they want and is easily found by our target customers. Let's discuss more on Skype/upwork Skype ID:___ "
Here’s another format of proposal that got many responses and eventually jobs regarding “keyword research” projects. "low/medium competition" - which is where after some good work, your website can be on Page 1 and start bringing the traffic in. my best experience has been in keyword research and finding the perfect ones for any specific website customized for them. "It was an awesome experience." "Very good and stayed on top of all deliverables. Thank you! " Skype ID : _____ "
Refining your proposals is an on-going journey and you can continually keep improving. Here are a couple ones you can read for learning more about proposals on Power proposal tips and Top mistakes in proposals. Getting your first customer dependents on your ability to show the client that you can complete the work within time without compromising the quality. Here’s an example of one of the earliest jobs I got in the SEO field at the start of my freelancing career last year. SEO was a diversification of my skills I did because I was exploring digital marketing and seo at the time and wanted more work on the same. Look at the questions asked before even working towards getting any work. In a previous conversation, I had proposed a 2 week pilot project where I would do certain things. The client came back to me with more questions and I had to follow up once more to get the final offer from them. Clients are business owners and in most cases, very busy and are handling multiple threads. Always Follow up in a good manner – the follow up here is not very good as it was too early on my journey but it did work. In any kind of follow up – always ask if they have any questions for you and just seek to add value more. And you should finally ask if they still need your help in any way at all. 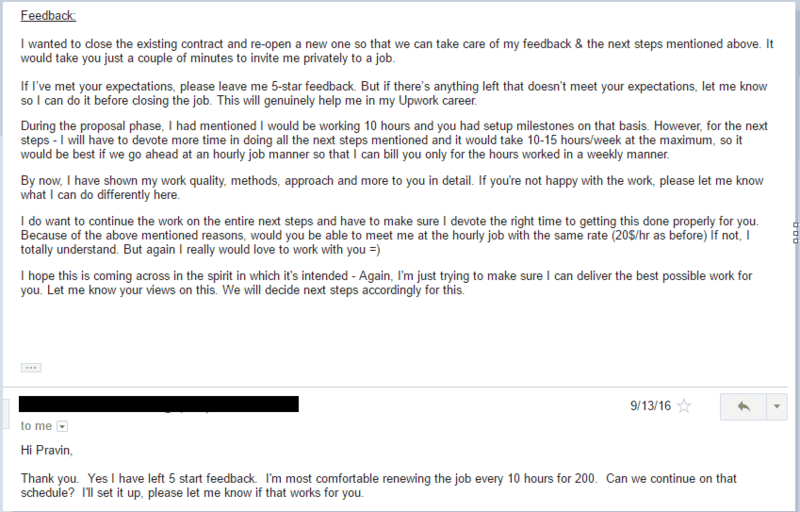 This is the final conversation and you can see my first 20$/hr work being awarded. After getting your first project, it’s essential that you treat it with utmost sincerity and respect as this will pave the path to your next projects. Here’s one of the latest offers I got that I accepted from a client for some analytics and dashboards related work. You are no longer in a big company with multiple teams. You should remember that you are the sole owner of your entire business here – there is no sales team, no execution teams, no delivery teams. Delivering your work is absolutely critical as per the requirements laid down. There are three main things here which are also very important for giving your clients a great experience. Regular communication with the client with updates on the project is crucial. For long term projects, I like to do a “2 week pilot” where I plan to give extraordinary work and win them over just by my service, work quality and the entire experience. Setting timelines for the project is crucial for setting expectations right with the client. Always add “buffer” time before giving the time estimation for any project. Buffer could be a few days to more depending on the level of work. In the 1-2 week pilot project that we decided everyone should start off with, this is your golden time period to win over a client for long-term. What you do for this small time period decided how long the client will be with you. So two words – Always Over-deliver! Do much more than what was asked for you to be done! If the requirements were A, B and C – you must do that and add your own D, E along with next steps and ways to grow the client’s business using your skills – this is very key in initial stages if you want to convert your pilot projects to long term ones. Client feedback is more important than money in the initial days. You should ask your client for the feedback after the completion of the project. This should ideally only be done after a good amount of work has been done, value has been created for the client, there is goodwill and trust in between both of you. The way you should ask for a feedback is something similar to below. It’s great that you want to attract customers like flowers attracts honey bees. In marketing – this is called the “pull” process instead of a “push” – you want to make your profile a “Pull” for clients. Define the PROBLEMS that they face with respect to your work and niche. Define the RESULT you will give them. All the above 3 steps require significant research on what your work is, what your profitable niche is, who your clients are, how exactly will you add value to their lives and much more. Your profile should not be about YOU. 99% of freelancer profiles are about themselves. It’s a big mistake! Yes – I am repeating this again here as I really want to drive this point home. A client does not give a f*** about who YOU are. They want to know how YOU can HELP them to SOLVE their PROBLEMS. So, your profile should not be another resume about you at all. Pro Tip: Add “testimonials” also on your profile when you get feedback from your clients. I wanted to give out full credit to some mentors and great marketers. I learnt principles and psychology related to freelancing and online businesses from Danny Marguiles & Ramit Sethi. For online marketing, seo and digital marketing related – I have learnt massively from Neil Patel’s blogs and his ultimate guides. If you want to learn more, I would highly recommend checking these out. Phew! That must have been a lot to digest if you read it all in one go! Well, you know what it takes to build a freelancing business, you’ve been handed a very simple system structured in a manner to help you out. Now, it’s time for the ACTION. Do not read any more information. Information overload and undertaking action is the saddest thing to see around these days. I would be really happy if you took action after reading this. If you follow the steps and do all the hard work, we would love to know about more problems you face, successes you attain and more. Comment and let me know what are your obstacles to becoming a freelancer? Pravin is a full time freelancer and offers his services on Website analytics & data visualizations. After working for 3 years at Mu sigma Inc, he quit his job to run his own freelancing business and venture out on more scalable online business. Really well articulated I must say. Gave me a lot of insights. I would say, it absolutely will inspire people, who are looking to freelance, to take action. But, I think this is a good place to raise my concerns regarding Ramit Sethi. I have not taken any of his courses nor I ever will (I have a rule, I don’t pay for courses which don’t improve my skill set. )All the content he creates preys on everyone’s basic instincts. I see most of the students coming out of his course do similar things, with few exceptions. Everything is based around making more money, losing weight, getting better at dating, but the funny part is all they talk about is to take action without providing any actionable steps. Pradeep too talks about making money, but gives actionable steps and doesn’t ask you to join some scammy framework course. Just to be sure, I bought and read Ramit’s book Iwillteachyoutoberich. What a B.S. And his brother Mr. Manish Sethi is scamming his way towards making money by selling people a product called Pavlock. Here is what happened when Manish pitched pavlock at Shark Tank. The reactions that sharks had was perfect. I wanted to react the same way to all of Sethi Brother’s Products. They are great Salesmen. Absolutely brilliant. But, what they are selling is utter Crap. Glad you liked the article – hope you use the insights well and take action. Regarding Ramit sethi – I only have good things to say about his books, courses and his material as he has added immense value for me in completely action oriented manner only. As a pointer, I just take the best possible things from everyone and ignore the rest. I am happy for you. You are on fast forward track with your decision to quit a well paid job and go for your freelancing business. It is all your passion and hard work. Keep it up. With the obvious rise in technology use, freelancing is going to be the thing for future. More and more Generation Y or millennial are abandoning 9 to 5 job. My good wishes. Put your best, do great and be the inspiration of genY and future freelancers. Thank you, Uncle, for the kind words. Nice story Pravin and best wishes on your freelancing journey. I also am working on a side hustle and your story is a source of inspiration for me. Let us know if you need any help from our side. When trying to improve your freelance workflow, remember why you set out to work for yourself. It’s all too easy to get caught up with the hard bottom line of your day-to-day business, and anyone who’s tried knows it’s not easy, but it’s crucial to remind yourself to enjoy the path you are on. By following the tips detailed above, you are giving yourself permission to be happy as a freelancer. And at the end of the day, that’s what being your own boss is all about. “Start with WHY” is a great concept brought about by Simon sinek and everyone should really audit that before starting out anything. It really does help in the face of obstacles, problems, the bad days and much more! thanks for the insight, Jon – fun and scary are definitely two ways of describing freelance life! And, yes, if things don’t work out you can always go back to real job, complete with a fresh new set of skills and a better understanding of how you like to work. Nice post. It’s been 3 years into freelancing now, and I’m happy working from anywhere. Though ‘Upwork’ is my first preference, I was wondering why ‘Fiverr’ isn’t in the list. Nice story sir. i am very much inspired by you…i am also looking for starting my freelancing career.looking for your help..
Kindly help me immediately in earning income online. Thank you to share your experience. When we read some real experiences we get motivated. Here, as everyone wants to earn an extra source of income, I am trying too. On googling to get the extra source of income I have recently come to know about freelancing but a far way to go. Got in touch with Pradeep goyal in socail network while reading his story and he is sending inspiring mails which is motivating me to read everyday about freelancing and to try finding some source to write. In today’s mail, he has mentioned about you and this is how i read your story. Hope the best in the future. Your article came at right time.I am just glad that you have already established your business in data Visualization and Data analytic. It’s motivating me a lot to start my freelance work in excel, data analysis. i quite my job for the same purpose. I have been into these excel work from last 3 to 4 Years and worked in different companies. Your profile looks very much professional on up work and gives an Insight how it should be to grow your business. It’s quite satisfactory as well that you built this in last 2 years which seems to be impossible to most of the freelancers and they quite.